Upgrade your browser or download Adobe Flash. A Record Suspension (Pardon) application can be completed by individuals without the assistance of a lawyer or any other agency. If it has been five (5) years (summary offence) or ten (10) years (indictable offence), since you completed your last sentence, you may apply to the Parole Board of Canada for a record suspension. Everything you’ll need to know is included in a booklet put out by the Parole Board of Canada, which is available, free of charge from the Records office of any police agency. 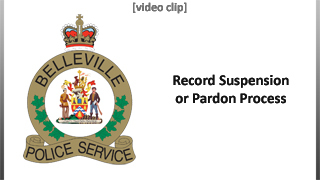 You can download a Record Suspension Application Booklet from the Parole Board of Canada website at http://pbc-clcc.gc.ca/prdons/servic-eng.shtml. Part of the application process involves submitting fingerprints. Simply call Belleville Police Service’s front desk at (613) 966-0882 x2211, and request an appointment for Record Suspension (civilian) Fingerprints. The fee, CASH ONLY for Record Suspension Digital Fingerprints is $45, for Belleville residents, OR $65 for NON Belleville residents (both fees include RCMP’s $25 Fee). You will be asked to provide two pieces of valid personal identification (one with a photo) when you attend for your fingerprint appointment. When your fingerprints are received back from the R.C.M.P., a copy of the Local Police Records Check form in the booklet must be taken to every police agency where you have lived in the past 5 years. In Belleville, this form must be brought to the front counter of our police service at 93 Dundas St. E., along with two pieces of valid personal identification (one with a photo). We charge a fee of $20.00 (CASH ONLY) at the front counter for this service. A clear photocopy of two pieces of valid identification (one with photo) must accompany the form, along with a certified cheque or a postal or money order in the amount of $20.00 CDN. The form will be processed within 14 days of receipt and mailed back to you. Please be sure to include a return address and telephone contact information. You do not need a lawyer or representative to apply for a Record Suspension. This will not accelerate the review of your application, nor convey it any special status. The Parole Board of Canada treats all applications in the same way, regardless of whether it was submitted through a lawyer or private company, or directly by the applicant themselves. You can apply for a Record Suspension by following the step-by-step instructions and submitting your completed application forms to the Parole Board of Canada with a $631.00 processing fee made payable to the Receiver General for Canada. For more information or assistance with obtaining a Record Suspension you may call the Parole Board of Canada at 1-800-874-2652. Content may not be copied or reproduced in whole or in part without written permission. This site is compatible with Internet Explorer 8+, Firefox 3.6+, Opera 11+, Chrome 2+, Safari 3.1+ and various mobile browsers. You should upgrade your browser if you do not meet these requirements. This site is designed for 1024x768 resolution.